Charles C. Nott and Cephas Brainard spent weeks researching the background and footnotes for the speech. Francis Fisher Browne alluded to this publicity process which culminated in a heavily annotated edition: “This speech made Mr. Lincoln known throughout the country, and undoubtedly did more than anything else to secure him the nomination for the Presidency. Aside from its extensive republication in the newspapers, various editions of it appeared in pamphlet form, one of the best of which was issued by Messrs. C. C. Nott and Brainard, who appended to their edition an estimate of the speech that is well worth reprinting here: ‘No one who has not actually attempted to verify its details can understand the patient research and historical labor which it embodies. The history of our earlier politics is scattered through numerous journals, statutes, pamphlets, and letters; and these are defective in completeness and accuracy of statement, and in indexes and tables of contents. 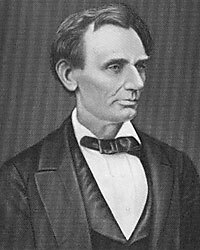 Neither can anyone who has not travelled over this precise ground appreciate the accuracy of every trivial detail, or the self-denying impartiality with which Mr. Lincoln has turned from the testimony of ‘the fathers’ on the general question of slavery to present the single question which he discusses. From the first line to the last, from his premises to his conclusion, he travels with a swift, unerring directness which no logician ever excelled, — and argument complete and full, without the affectation of learning, and without the stiffness which usually accompanies dates and details. A single easy, simple sentence of plain Anglo-Saxon words contains a chapter of history that, in some instances, has taken days of labor to verify, and must have cost the author months of investigation to acquire; and though the public should justly estimate the labor bestowed on the facts which are state, they cannot estimate the greater labor involved on those which are omitted — how many pages have been read — how many works examined — what numerous statutes, resolutions, speeches, letters, and biographies have been looked through. Commencing with this address as a political pamphlet, the reader will leave it as an historical work — brief, complete, profound, impartial, truthful — which will survive the time and the occasion that called it forth, and be esteemed hereafter no less for its intrinsic worth than for its unpretending modesty. '”6 Nott wrote Mr. Lincoln on May 23, 1860. I enclose a copy of your address in New York. We (the Young Men’s Rep. Union) design to publish a new edition in larger type and better form, with such notes and references as will best attract raders seeking information. Have you any memoranda of your investigations which you would approve of inserting? You and your Western friends, I think, underrate this speech. It has produced a greater effect here than any other single speech. It is the real platform in the Eastern States, and must carry the conservative element in New York, New Jersey, and Pennsylvania. Therefore I desire that it should be as nearly perfect as may be. Most of the emendations are trivial and do not affect the substance — all are merely suggested for your judgment. I cannot help adding that this speech is an extraordinary example of condensed English. After some experience in criticising for Reviews, I find hardly anything to touch and nothing to omit. It is the only one I know of which I cannot shorten and — like a good arch — moving one word tumbles a whole sentence down. Yours of the 23d, accompanied by a copy of the speech delivered by me at the Cooper Institute, and upon which you have made some notes for emendations, was received some days ago — Of course I would not object to, but would be pleased rather, with a more perfect edition of that speech. I did not preserve memoranda of my investigations; and I could not now re-examine, and make notes, without an expenditure of time which I cannot bestow upon it — some of your notes I do not understand. So far as it intended merely to improve in grammar, and elegance of composition. I am quite agreed; but I do not wish the sense changed, or modified, to a hair’s breadth. And you, not having studied the particular points so closely as I have, can not be quite sure that you do not change the sense when you do not intend it. For instance, in a note at bottom of first page, you proposed to substitute ‘Democrats’ for ‘Douglas.’ But what I am saying there is true of Douglas, and is not true of ‘Democrats’ generally; so that the proposed substitution would be a very considerable blunder. Your proposed insertion of ‘residences’ though it would do little or no harm, is not at all necessary to the sense I was trying to convey. On page 5 your proposed grammatical change would certainly do no harm. The “impudently absurd” I stick to. The striking out ‘he’ and inserting ‘we’ turns the sense exactly wrong. The striking out ‘upon it’ leaves the sense too general and incomplete. The sense is “act as they acted upon that question”—not as they acted generally. After considering your proposed changes on page 7, I do not think them material, but I am willing to defer to you in relation to them. On page 9, striking out “to us” is probably right. The word “lawyer’s” I wish retained. The word “Courts” struck out twice, I wish reduced to “Court” and retained. ‘Court’ as a collection more properly governs the plural “have” as I understand. “The” preceding “Court,” in the latter case, must also be retained. The words “quite,” “as,” and “or” on the same page, I wish retained. The italicizing, and quotation marking, I have no objection to. William Harlan Hale, Horace Greeley: Voice of the People, p. 214. William Lee Miller, Lincoln’s Virtues, p. 384. Reinhard H. Luthin, The First Lincoln Campaign, p. 81. Abraham Lincoln Papers at the Library of Congress. Transcribed and Annotated by the Lincoln Studies Center, Knox College. Galesburg, Illinois. (Letter from James A. Briggs to Abraham Lincoln1, February 29, 1860 CWAL, Volume III, 554-55.). Francis Fisher Browne, The Every-Day Life of Abraham Lincoln, p. 317-318. Henry Rankin, Abraham Lincoln, p. 256-257. Roy P. Basler, editor, The Collected Works of Abraham Lincoln, Volume IV, p. 58 (Letter to Charles C. Nott, May 31, 1860).